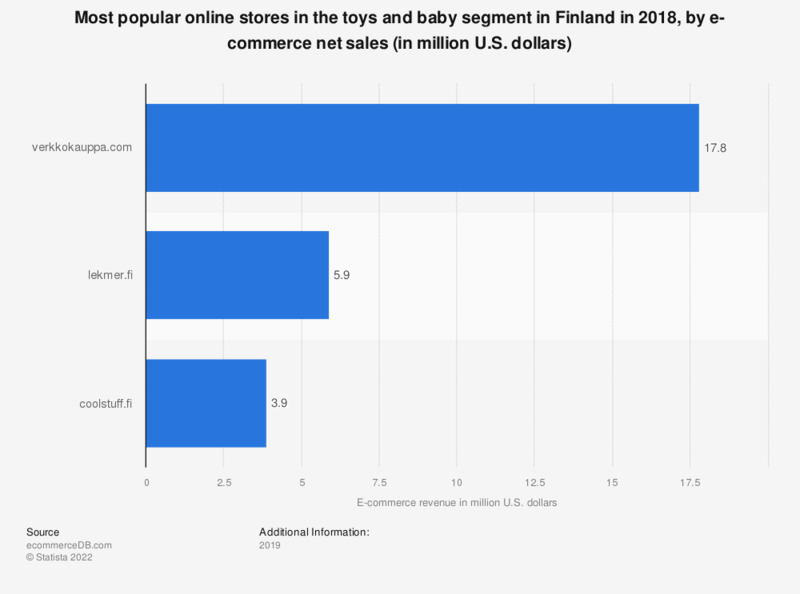 This statistic presents a ranking of the most popular online stores in Finland in the toys and baby segment in 2018, sorted by annual net e-commerce sales. In 2018, market leader verkkokauppa.com generated 17,8 million U.S. dollars via the sale of toy and baby products in Finland. The online store lekmer.fi was ranked second with a revenue of 5,9 million U.S. dollars. The e-commerce market category “Toys & Baby” includes the sale of toys, and products for infants (e.g. clothing, care products, baby food, bottles, nursing products, playpens, strollers, and car seats).